What was there lacking about that program [dated February 1, 1867] to make it perfectly irresistible? Nothing that any finite mind could discover. Paris, England, Scotland, Switzerland, Italy- Garibaldi! The Grecian Archipelago! Vesuvius! Constantinople! Smyrna! The Holy Land! Egypt and "our friends the Bermudians"! People in Europe desiring to join the excursion.... Human nature could not withstand these bewildering temptations. ... the moment I saw the brillant, proud morning shine hiqh over the deserts of Santa Fe, something stood still in my soul, and I started to attend. Santa Fe is more than a place, it is an atmosphere. An atmosphere that has attracted artists, writers, photographers, designers, intellectuals and lovers of beauty for decades. Today, thc town is known as the source of the "Santa Fe Style." Mark Twain's "innocents" went abroad to attend the Paris Exhibition of 1867 and to visit "Italy, Greece, Crimea, Holy Land, Egypt, etc. [on] The Magnificent side-wheel ocean steamship Quaker City." The western European Grand Tour (Towner 1985) stage of their journey was to be enhanced by the Paris Exhibition, "a worldwide bazaar [representing] every country with any national pretension�from Great Britain and the United States to Siam and Loo-choo ... [and] to be (its advance publicity promised) the most spectacular display of art and industry the world had ever seen . . ." (Ganzel 1968: 2-3). Twain and his fellow "pilgrims" embarked from New York City on June 8, 1867 and returned to the ship's berth at the foot of Wall Street on November 20 of that year. His book, which appeared on July 20, 1869, is based on correspondence with San Francisco's Daily Alta California and New York's Tribune and Herald newspapers. In the preface Twain (1966: 15) asserts that it "is a record of a pleasure trip ... to suggest to the reader how he would be likely to see Europe and the East if he looked at them with his own eyes." 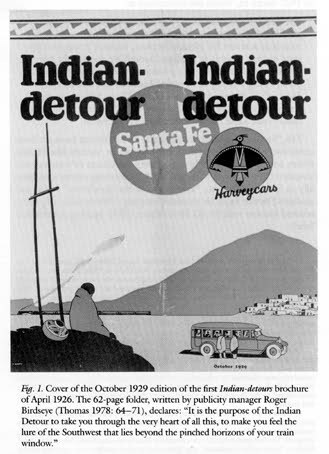 Some sixty years later, the Atchison, Topeka & Santa Fe Railway and its close associate, the Fred Harvey Company, launched Indian Detours (Fig. 1) on the way to California. These "Grand Tours" were chauffeured and guided automobile trips away from the railroad lines through New Mexico, where, founder Major R. Hunter Clarkson proclaimed on August 29, 1925, "There is more of historic, prehistoric, human and scenic interest ... than in any similar area of the world, not excepting India, Egypt, Europe or Asia.... The big idea is not only to let people know what is in Northern New Mexico but to tell them what it is when they see it" (quoted in Thomas 1978: 52-53). Before the first Harveycars with their "cowboy" drivers and "Indian maid" Courier guides began excursions between Las Vegas, Santa Fe, and Alburquerque on May 15, 1926, a National Geograpbic ad (in Manchester 1987: 188) heralded the Detour as the "newest way to see oldest America on your Santa Fe-Fred Harvey way to and from California": "Three days personally-conducted motor tour in luxurious Harveycars through a region rich in history and mystery�the Enchanted Empire. Only $45 extra with everything. provided�meals, lodging and motor transportation." not merely my state of mind. It was really an interesting place�possibly the only town of its kind anywhere. You couldny dismiss it as a resort for pleasure seekers, because it was also the state capital, as well as a refuge favored by doctors for tuberculosis cases. Santa Fe was a mecca for American Indian experts, being a living museum of Mexican and Indian culture. Most of all, it was an artists' colony. These differences didn't leap at once to the eye-I doubt if my Detour dudes saw them-but Santa Fe was a rich, rare city to live in. PIÑON-A member of the pine family, grows throughout the Southwestern states. The nuts of the Piñon tree are gathered and roasted by the Indians, and its wood burned for heat in their kivas and bread ovens. This incense presents the warm and woody fragrance of burning Piñon. It will add a gentle and comforting ambiance to your home. 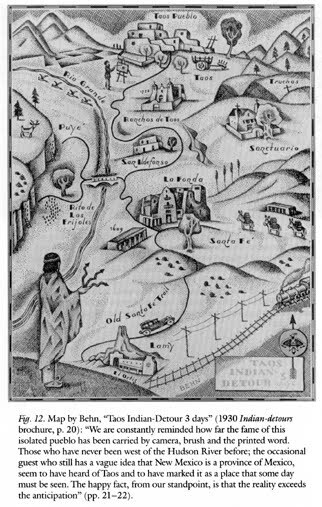 The Santa Fe Incense Company label is but one example of what John D. Dorst terms auto-ethnographic self-inscription in his analysis of the "distinct postmodern micro-climate" of Chadds Ford �both a tourist site and a suburb in the Revolutionary War- and-Wyeth country of the middle Brandywine River Valley between Philadelphia and Wilmington.5 Unlike the "written suburb" of Chadds Ford, however, Santa Fe as a postmodern site "is not only infinitely self-referential but also aware of its textuality and capable of textualizing (and commodifying) even this very awareness." Santa Fe also differs from Chadds Ford because it manifests "a self-directed sense of humor in [its] cultural production" and does not, as Chadds Ford does, "take itself quite seriously" (Dorst 1989: 115). On the Quaker City's return in November 1867, Mark Twain (1966: 469) evaluated his tour and fellow "picnic crowd" in a letter to the editor of the New York Herald, "It was not lively enough for a pleasure trip; but if we had only had a corpse it would have made a noble funeral excursion.... The advertised title of the expedition � 'The Grand Holy Land Pleasure Excursion �was a misnomer. 'The Grand Holy Land Funeral Procession' would have been better �much better." 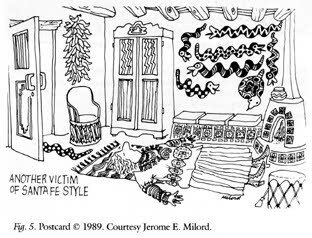 Santa Fe satiric artist Jerome Milord's 1989 postcards (Figs. 2-9) do for Southwest lures what Twain did for the Americans' cruise. For those who have seen one Pendleton-cosseted, turquoise- draped Navajo too many, from Santa Fe, N.M., there comes this poster, spawned by Lewis E. Thompson, an advertising man, and Jerome Milord, an artist. "It's about time we started making fun of ourselves," said Mr. Milord, who has lived there since 1964 and has thereby earned the right to fight the hype. He admits to living in a piñn-scented adobe house filled with niches [sic], santos and trasteros. But he is eyeing his decorative pink coyote as kindling for his kiva fireplace. From Smyrna towards the Holy Land the course will lay through the Grecian Archipelago. . . . Beirut will be reached in three days. At Beirut time will be given to visit Damascus; after which thc steamer will proceed to Joppa. �Mark Twain, The Innocents Abroad, 20. Of the beaten paths in our Far Southwest, few ["the steel ribbons of tbe railroads"] are of tbe kind we all know. More are of a very different sort. . . . They lead away into the hinterlands of New Mexico and Arizona, far from the familiar beaten path of the railroad. They criss-cross a last frontier that has taken 350 years to subdue. Tbhey find out buried cities that flourished when Britons crouched in caves, reach medieval Spain dreaming away the centuries in the mountains of America, and string together age-old Indian pueblos where one may "catch archaeology alive." They seek out the mines, the lumber camps, the open ranges and the painted canyons of the least-known and most fascinating corner of the United States. (Chicago: Rand McNally, January 1, 1929). The Atchison, Topeka & Santa Fe Railway, founded by Colonel Cyrus K. Holliday (1826-1900), was launched on October 30, 1868. On April 26, 1869, at a picnic to celebrate completion of the first seven miles of track, Colonel Holliday proclaimed: "The coming tide of immigration will flow along these fines and, like an ocean wave, advance up the sides of the Rockies and dash their foamy crests down upon the Pacific.... See, there rolls the broad Pacific, and on its breast are the ships of the Santa Fe riding in from the Orient" (Bryant 1974: 2). What the Santa Fe Railway, like the Santa Fe Trail traders before them, actually encountered was not the Orient but Mesoamerica�Mexico�;the Aztecs, at Pecos Pueblo, New Mexico's first tourist trap. Abandoned by the Pueblo Indians, who moved to Jemez in 1838, it was supposed to be Montezuma's birthplace, which he had left to found the Aztec nation at Mexico City and to which he would one day return. The first reported Pecos souvenir was purchased in September 1839 by journalist Matthew C. Field (writing for the New Orleans Picayune) and Dr. David C. Waldo. An old shepherd fed them supper and told them about the last people tending Montezuma's fire, which finally went out when the chief, his daughter, and her lover died of "pestilential disorder." The next day he offered to show them the fire's cave but they ran out of time and so paid him "a few bits of silver," then "pocketed a cinder of the sacred fire and departed" for San Miguel (cited in Kessell 1979: 472, 459-62; see also Weigle and White 1988: 67-75; Weigle 1989: 116-20). The Santa Fe Railway marked Pecos as a wonder of the Southwest with a giant trackside sign. Earlier, though, Santa Fe Trail travelers knew it by word of mouth. The first heralded hostelry belonged to Martin Kozlowski, a Polish immigrant who came to New Mexico after 1846 with the Missouri Volunteers (Simmons 1986: 184). 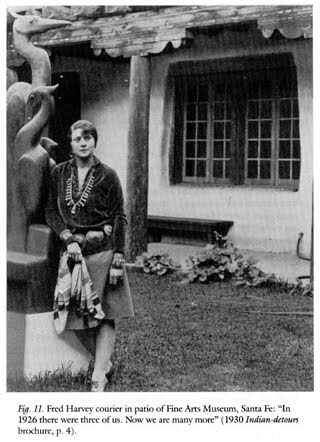 Travelers were relatively safe near his house, which boasted an ample supply of wood and water and a good cook in Kozlowski's wife. They could walk around the ruins at night and become tourists in Mexico. The Kozlowskis' establishment is now part of Greer Garson and her late husband, Buddy Fogelson's, Forked Lightning Ranch, focus of a land development brouhaha in the winter of 1990. The story was broken by the weekly Santa Fe Reporter in its "Happy Holidays!" issue of December 20-26, 1989: "Developers Seek Greer Garson Ranch for Huge Resort City Near Pecos." Capital Developers International, Inc., of Orlando, Florida (home of Walt Disney World), headed by Greek developer Jerassimos Crassas, was negotiating with Garson's representatives for a complex to be known as Santa Fe East 2001. A spread of 11,892 acres (including Los Trigos Ranch, owned by Fogelson's son Gayle), it was to include an airstrip, a three hundred-room hotel on 92 acres, ranch-size and "higher density" residential housing on 7,234 acres, "extended stay" cabins on 480 acres, an athletic center on 729 acres, a convention center on 160 acres, a hunting preserve on 1,776 acres, a health clinic on 100 acres, two 18-hole golf courses on 448 acres, and a shopping center called "World's Fair Today" and featuring "goods and commodities from around the world" on 454 acres. A swarm of swarthy, noisy, lying, sboulder-shrugging, gesticulating Portuguese boatman, with brass rings in their ears and fraud in their hearts, climbed the ship's sides, and various parties of us contracted with them to take us ashore [at Fayal, the Azores] at so much a head, silver coin of any country... The group on the pier was a rusty one-men and women, and boys and girls, all ragged and barefoot, uncombed and unclean, and by instinct, education, and profession beggers. . . . Here and there in the doorways we saw women with fashionable Portuguese hoods on. This hood is of thick blue cloth, attached to a cloak of the same stuff, and is a marvel of ugliness.... There is no particle of trimming about this monstrous capote, as they call it-it is just a plain, ugly dead-blue mass of sail, and a woman can't go within eiqht points of the wind with one of them on; she has to go before the wind or not at all. "The guy who into town at niqht will find himself surrounded by women: they sell him his gum, show him their paintings, mix his maigaritas. . . . Women are everywhere! ... Two women, wineglasses in band, [are] deep in convenation. They are classic Santa Fe. They wear layers, lots of them�-sweaters, jackets, capes. They wear silver bracelets, lots of them, and turquoise around their necks. . . . They don't smell of Norell, they smell of woodsmoke and brandy. " But when hunting down these women, the article suggested, "don't park your Prosche in front of the Bull Ring, flash your coke spoons, and think you'll be instantly inlited to the best parties of the younger set. You've got to be more "centered' than that. " �"The Wrong Article,' Santa Fe Reporter, December 27, 1989-January 2, 1990. The uniforms were selected with thought to the duties of the girls (they had to be hard wearing), the attractiveness (they had to be colorful), the theme of the tours (they must show Indian influence) and they had to be comfortable. Each courier was requested to wear a silver concho belt and either a squash blossom necklace or other Indian jewelry. These examples of the Indian silversmithing art not only intrigued the Eastern tourists and gave the couriers a conversational springboard, but tempted the Detourists to buy from the Indians when touring through their pueblos. One Detourist wrote a report for the New York Times Magazine, saying, "our guide tells the tale, a pretty young college girl in high boots and a 10-gallon hat, with enough Indian jewelry to open a curio shop." In his analysis of "the catalogues published by the (at least until very recently) highly successful Banana Republic Travel and Safari Clothing Company, which began in 1978 in San Francisco in order to offer, according to the Fall 1987 catalogue, 'the kind of clothing we [Mel and Pat Ziegler, founders] liked and couldn't find: intelligently designed, comfortable, natural-fabric garments for dedicated travelers and other independent souls who don't step to the march of fashion,"' Stephen Tatum (1989: 9, 12-13) quotes a text on the "Concha Belt": "American cowboys first used silver conchas (Spanish for 'shells') on their spur straps. Later they linked them into belts, and decorated their chaps, hatbands, and bridles. The cowboys stole the idea from the Indians, who stole it from the Mexicans. We're just borrowing it from all of them." He claims that this "catalogue description suggests that we can't enjoy this beautiful object without knowing its origins and descent in both primitive folk cultures and individual craftsmanship. By endowing this commodity with a pedigree, however, the description both reveals and conceals, due to its resonant verb 'stole,' the troubled history of race relations in the Southwest." Such advertising is an example of what Roland Barthes (1982: 150) calls "the inoculation," a rhetorical strategy in bourgeois myths that immunizes "the contents of the collective imagination by means of a small inoculation of acknowledged evil; one thus protects it against the risk of a generalized subversion." In Indian Detours, the "Cowboy" is suggested by the highly trained drivers, who sported what Albert D. Manchester (1982: 44) calls "a uniform which made them look like polo players inspired by Zane Grey. They went outfitted in English riding boots and breeches, a colorful cowboy shirt and silk neckerchief, and a Tom Mix-size ten-gallon hat. They managed to look dashing enough, and their strong silent act inspired confidence in the tourists." Strolling around the [Santa Fe] plaza at lunchtime on an idle day, I would pause every few steps to chatter with friends�an English girl training to be a vet, a hopeful t.b. case, a sculptor, a curio dealer, an archeologist, a millionaire in search of something to do. They all dressed the same, too, in Levi's, boots, and bandannas. It was the holiday uniform�the Santa Fe uniform. Nobody could have told the difference in people's social strata. They didn't fit neatly into categories there; Santa Fe had a way of mixing them up. A local banker turned to painting and became a professional; one of the Mexican workmen had an operation for tuberculosis that attracted a lot of attention and cured him; summer visitors fell in love with the town, bought land, built houses, and became permanent residents. Everyone fitted in, I reflected comfortably. Within this small space, alongside ancient natural beauty and fast-lane squalor, we co-exist. There is room here, amidst the contradictions, for everyone. The cover photograph on their "little book" of "contrasts and insights ... [with] a subtle impact ... [giving] a new perspective on the city to visitors and residents alike" shows a "professional clown (Chuck Sidlow) and man (A. Montoya) on a bench at the Plaza." One of Contreras's photographs inside (1986: 65) is of a "masked dancer" who carries a long line or ribbon along the train tracks. Her color photographs of such costumed figures are featured on a postcard, "Apparitions and Amtrak," about appearances staged by Victoria Cross in 1985 with partial fimding from the National Endowment for the Arts and the New Mexico Arts Division. The back of the postcard describes these illusory Couriers as psychopomps: "Sightings of 'Los de Los Suefios' (The Ones of the Dreams') have been reported along the train track in the Lower Canoncito area just east of Lamy, New Mexico train station. They are gentle reminders for the Amtrak passenger that one's dreams are exciting aspects of oneself." As we came dawn through the town [Fayal, the Azores] we encountered a squad of little donkeys ready saddledfor use.... Half a dozen of us mounted the ungainly affain and submitted to the indiqnity of making a ridiculous spectacle ofounelves through the principal streets of a town of 10,000 inbabitants. It was fun. . . . There was that rare thing, novelty, about it; it was a fresh, new, exbilarating sensation, this donkcy riding, and worth a bundred worn and threadbare home pleasures. �Mark Twain, The Innocents Abroad, 44-45. "They want ten dollars for them hawlin' dawgs!" The main line of the AT&SF Railway opened for operation between Las Vegas and Galisteo junction (later Lamy) on February 9, 1880, and the branch line north to Santa Fe was in service by Feb- ruary 16. Six weeks later, a remarkable sighting was reported in the Santa Fe New Mcxican of March 26, 1880 (Weigle and White 1988: 140-41). The stationmaster and two friends were walking on the plafform after the Santa Fe train's arrival and were astonished to see a "monstrous," fish-shaped balloon covered with "fanciful characters" approaching from the west. They heard "loud shouts, in a language entirely unknown to any of the party and "laughter and occasionally strains of music." A "large fanlike apparatus" guided the craft, and "the occupants could evidently sail at any height they chose, as soon after passing the Junction, it assumed a great height and moved off very rapidly toward the east." The fish-shaped air machine sailing quietly and swiffly from west to east is a Symbolic inversion of the serpentine ground machine noisily and slowly inching westward. The bafloon's apparently friendly, cultured, and merry passengers dropped two items overboard: "a magnificent flower, with a slip of exceedingly fine silk-like paper, on which were some characters resembling those on Japanese tea chests," and a cup "of every peculiar workmanship, entirely different from anything used in this country." On March 27, the paper reported that "a collector of curiosities passed through this place and ... offered such a sum of money for [the flower and cup] that it could not be refused and he became the possessor of them. He gives it as his opinion that the balloon must have come from Asia, and thinks it possible it came from Jeddo." This apparition from the Orient so grandly sought by the Santa Fe's founders confirmed the worthiness and portended the success of their enterprise. The Thunderbird was supposed to ensure success for another new machine then insinuating itself into the region: the automobile. The first fleet of seven-passenger Harveycars were Packards, painted "Tesuque" brown, rather than the blue coloring on test vehicles, with an official Thunderbird insignia on the door. It was decided an official coloring should have an official name, and although the White factory designated them as Mecca tan and Biskra brown, it was decided by Clarkson to call the brown 'Tesuque' in honor of one of the pueblos they would visit. ". . . an enigmatic black fowl upon a vivid orange background. This Thunderbird is a creature of early American mythology whose obsidian feathers clash against each other as he flies, making the thunder of the sununer showers, so life giving to the crops. He is considered a harbinger of abundant harvests and is the symbol of good luck." "The harder it is to get to Santa Fe, the longer we keep it as it is, dony you see. I know what your say-that we're bound to lose out anyway in the end. But I say why shouldny we do our damndest to hold up the wheels of progress? As long as we can, anyway. If only somebody would blow up the whole Detour garage and get rid of those horrible buses and all the pesky little couriers-Oh, I'm sorry." She nodded abruptly toward me. "I forgot about your job." I saw the Detour differently-I saw Santa Fe itself in a new light.... Now I learned that Santa Fe had been an even lovelier city half a generation earlier-smaller, wilder, more innocent. I learned that some of the newly built houses were all wrong for their background, that the Indians were getting their values warped, that everything was becoming commercialized and spoiled. I was appalled, especially as they told me that I&emdash;I� was at least partly to blame for all this, with my Thunderbird buses and my courier sisters and dude groups. She "went home early, weighed down with guilt." "The free-standing coyote is our biggest selling item this summer," says Bonnie Montoya of the downtown jackalope Pottery. "We stock a whole line of painted wood coyotes, which sell for $9.95 to $24.95. They come in bright pastel colors and we just can't keep them in stock." Agreeing is David Higgins, manager of the Gift 'N Gourmet, a kitchen shop on the Plaza. "The coyote is still a real big sales item. We sell it on everything: mug racks, magnets for refrigerators, hot plate holders, candle holders, salt-and-pepper shakers, clocks, key holders, coat racks; and we even have some free-standing ones." In an article for the Los Angles Times, reprinted in The Santa Fe New Mexican of September 24, 1989, Jonathan Taylor discusses the role of woodcarvers Felipe Archulete, Alonzo Jiménez, and the five Alvarez brothers (Duane, David, Max, Elmer, and Rory) in developing the coyote figure. Taylor introduces his account by suggesting a traditional, indigenous symbolic source for the contemporary "mythologies" (Barthes 1982): "Maybe Indian mythology is right. . . . Maybe the coyote is God's Dog and the scourge of the range." They are Certainly ... a blessing to folk art carvers ... to say nothing of the countless painters, T-shirt makers, ceramacists and other artisans of varying degrees of talent and inspiration�who are doing quite well creating coyote-inspired products for sale to visitors of Santa Fe." They definitely have been, as mythology contends, a benefactor for folk art dealer Davis Mather, a native of Princeton, N.J. who moved to Santa Fe as a penniless graduate student in the 1970s and became the first person to sell Archuleta's carvings nationally, setting off the Southwest folk art frenzy. Mather since has made a living selling the coyote and other animal carvings in his Davis Mather Folk Art Gallery. Thank you, coyote, thank you. For months the great pleasure excunion to Europe and the Holy Land was chatted about in the nmpapen everywhere in America and discussed at countless firesides. . . . It was to be a picnic on a gigantic scale. The participants in it, instead of freighting an ungainly steam ferryboat with youth and beauty and pies and doughnuts, and paddling up some obscure creek to disembark upon a grassy lawn and wear tbenuelves out with a long summer day's laborious frolicking under the impression that it was fun, were to sail away in a great steamship with flags flying and cannon pealing, and take a royal holiday beyond the broad ocean in many a strange clime and in many a land renowned in history! �Mark Twain, The Innocents Abroad, 17. Harvey Houses, don't you savvy; clean across the old Mojave, On the Santa Fe they've strung 'em like a string of Indian beads. We all couldn't eat without 'em but the slickest things about 'em Is the Harvey skirts that bustle up the feeds. the Divine afflatus"' (Marshall 1945: 101). How many Santa Feans does it take to screw in a light bulb?� One hundred: one to screw it in and ninety-nine to attend the opening. �Joke first heard in 1989. According to the 1933 edition of The Oxford English Dictionary (vol. VII, 828), the word "'picnic' occurs (in reference to foreign countries) from 1748, but app. not before c. 1800 as an English institution." The first definition reads: "Originally, A fashionable social entertainment in which each person present contributed a share of the provisions; now, A pleasure party including an excursion to some spot in the country where all partake of a repast out of doors; the participants may bring with them individually the viands and means of entertainment, or the whole may be provided by some one who 'gives the party. . . . The essential feature was formerly the individual contribution; now, it is the al fresco form of the repast." 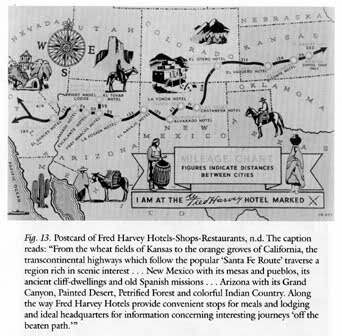 In New Mexico and the Southwest, good food and an manner of travelers' accommodations have been synonymous with Fred Harvey (1835-1901), known as the "Civilizer of the West," and his Harvey Girls (Henderson 1969; Poling-Kempes 1989). Al fresco Indian Detours picnics were also high-quality Harvey House fare: "The food was packed in leather chests, thermos bottles in leather cases held tea, coffee and water. And there was even the nicety of ice, carried in zinc-lined boxes" (Thomas 1978: 116; also Manchester 1987: 135-37). Spring is probably the most open time of the year where art in Santa Fe is concerned. Every other season brings tourists and collectors whose expectations must be met. Sununer sees the hype of "coyote art"; fall is the established time for buyers of serious regional work, and winter now has a commercial/cultural mystique all its own, centering on chiles and farolitos. The next wave of tourists won't be lured to Santa Fe by the museums, the galleries or the skiing. No, food will entice the great gourmets of the world up into the Sangre de Cristos, say both the New York Times and Gourmet magazine in just-published articles that ladle out generous portions of praise for the city's eateries." Nancy Harmon Jenkins, writing in the New York Times Sunday travel section, "reviews Rincon del Oso, Tomasita's, Pasqual's, the Pink [Adobe],9 the San Francisco Street Bar and Grille, and the Coyote [Cafe], of which she writes, 'Some Santa Feans love to hate this restaurant.' But she adds, 'This is cooking of a high order indeed, imaginative yet thoroughly grounded in a sense of place and tradition, and for the most part delicious.'" The front jacket flap copy of chef Mark Miller's book describes his Coyote Cafe cooking a "modern Southwestern cuisine ... constantly redefined . . . , blending centuries-old traditions with modem techniques and expressive flavors," and, "when you try [it] . . . , be prepared to kick back, let out a yell, and enjoy the sheer exuberance." Miller (1989: xvii), who opened the Coyote Cafe in 1987, earlier had bought a Leroy Ortega "carved cottonwood coyote" in Santa Fe and put it in his Fourth Street Bar and Griff (opened 1979) in Berkeley, California. Native American "mythologies" (Barthes 1982) prompted him to name his Santa Fe restaurant after a figure who, "according to legend, . . . is one of the progenitors of the beginning of time, and he is the symbol for the trickster and the merrymaker (he may have had something to do with why it took so long to open the restaurant, who knows?). His main purpose is to prevent the world from taking life too seriously. Sometimes he likes to dress up and go out on the town. . . . If you see someone really enjoying themselves at Coyote Cafe-eating, drinking, laughing and especially telling jokes-look carefully because it might be Coyote dressed up in one of his disguises." Danneskiold notes that Gourmet's Zanne Early Zakroff (1989) "rambles from meal to meal, but saves her highest praise for Cafe Pasqual's, Pink Adobe, Santacafe and, of course, Coyote Cafe." Christine Holmgren, media director of Santa Fe's advertising agency Creative Images, claims Zakroff's article "is worth hundreds of thousands of dollars in advertising." She is echoed by Bruce McDaniel, director of the Santa Fe Convention and Visitors Bureau: "When we're marketing Santa Fe, we're always saying we're willing to put our restaurants up against the finest restaurants in any city in the United States, including San Francisco. The restaurants will continue to be successful because Santa Fe cuisine is so unique." At last, away in the middle of the day, ancient bits of wall and crumbling arches began to line the way�we toiled up one more hill, and every pilgrim and every sinner swung his hat on hiqh! Jerusalem! �Mark Twain, The Innocents Abroad, 402. It bas been said that Santa Fe is a "vortex for transformation." Anyone you talk to can tell you their own story that even amazes themselves about the changes that have taken place in their life after being here awhile. If you feel yourself suddenly feeling like Santa Fe is calling you�like a siren song-you may have been chosen to be one of the ones ready for their own transformation. The change that comes may be a change of clothes�to the relaxed Western style, or a change of lifestyle�become more easygoing in this gentle "land of Mana [sic!]" �but the real change that is going on is in your heart. Santa Fe/Taos, December 31, 1989-January 27, 1990, 8. In his 1844 Commerce of the Praries, merchant Josiah Gregg (1954: 78) remembers Santa Fe Trail traders' arrival in Santa Fe: "I doubt ... whether the first sight of the walls of Jerusalem were beheld by crusaders with much more tumultuous and soul-enrapturing joy." Some ninety years later, the Santa Fe Railway and the Fred Harvey Company Indian Detours had transformed the region into a Midway Plaisance, an amusement zone for the "geography of the ideal" (Vance 1972) that the White City of California represented a West/Southwest become a giant World's Fair-in effect a desert turned Disney World (Weigle 1989: 130-35; also compare Hart 1983). 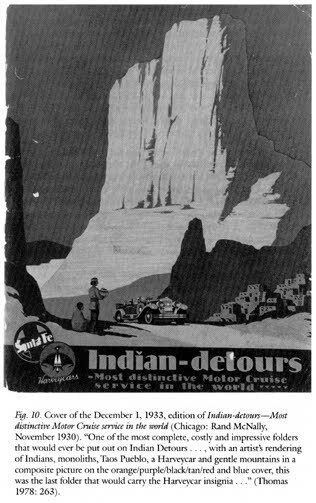 This world can be seen in the whimsical maps drawn by Behn for the November 1930 brochure, Indian-detours�Most distinctive Motor Cruise Service in the World (Fig. 12). Cinderella's Magic Castle, modeled after King Ludwig II of Bavaria's Neuschwanstein, is the center of Disneyland and Disney World. 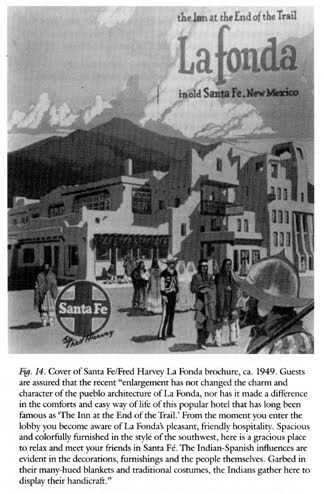 La Fonda, remodeled to resemble Taos and Acoma Pueblos, constellates the Santa Fe/Harvey/Indian Detours land and world (Fig. 13). Acquired by the railroad in 1925 and leased to the Fred Harvey Company in 1926, it became the showcase for a tricultural blend of architecture, interior decoration, and the merchandising of food, ambiance, arts, crafts, and local residents (Fig. 14). Architect John Gaw Meem modified the hotel's lines in his refinement of, and addition to, the existing structure, designed in 1920 by the Rapp and Rapp architectural firm. At its official reopening in 1929 it was hailed as "The Inn at the End of the Trail" (Weigle and White 1988: 57-61). What drew you to Santa Fe? I've had a love affair with it since 1937. I came here with my late wife for a short vacation, and kept coming back. When we missed a year, it felt like something was missing. After she died I remarried, and my new wife Linda liked it as much as I did. As a wedding present, Sam Ballen of La Fonda gave us. . . the Presidential Suite, so we came back and renewed our love affair with Santa Fe. Shortly after we came back again and couldn't find a hotel room, so we thought we'd better get a summer place of our own. What was the initial attraction of Santa Fe? It was completely different from any place we'd visited in this country, yet it was also within a reasonable distance of Dallas. And there've always been so many interesting people here. ... Tangier is the spot we have been longing for all the time. . . . We wanted something thoroughly and uncompromisingly foreign. . . . Tangier is a foreign land if ever there was one, and the true spirit of it can never be found in any book save The Arabian Nights. Here are no white men visible. . . . Here is a packed and jammed city enclosed in a massive stone wall which is more than a tbousand years old. All the houses nearly arc one-and two-story ... And the doors are arched with the peculiar arch we see in Mootish pictures. And the streets are oriental-some of them three feet wide, some six, but only two that are over a dozen.... Isn't it an oriental picture? �Mark Twain, The Innocents Abroad, 57-58. We visit SANTA FE because everybody goes to this city. It is said to be rich; if so it is exceedingly modest in its display. It is old-if that is an advantage. It has public buildings but they are insiqnificant; some old churches-made of mud; a few picturesque streets. But the adobe houses are at best poor things; they do not satisfy the artistic sense. Though they are regarded as a good card in this city which makes merchandise of its antiquity. Is Santa Fe Style a whim? A fad? A farce? We don't think so, and neither do the readers of 450+ articles printed throughout the USA in the last year. Do you live in Santa Fe because it's a fad? No. We live here because it is "(Timeless ... [Fort Worth, Texas]," because we love, the " . . [Spicy] Cultural Mix [New York City]," because we are forever "Falling for Santa Fe [Austin, Texas]." When tourists visit for these same reasons, they are spending resources that boost our economy. They increase our gross receipts tax, they pay lodger's tax and they buy our goods and services. They directly increase the number of jobs available in Santa Fe. So when you see a tourist in need, flash a smile and point the way-they are bringing more than questions and confusion. They are bringing $'s too! May 17, 1990, and in other local papers. The market place in Santa Fé was a wonder. In open air booths lay piles of food stuffs. Heaps of red and green peppers vied with heaps of red and blue corn and heaps of golden melons. There were colorful rugs woven by the hands of the Mexicans and deep-fringed shawls, gay with embroidery. There were massive Indian jars filled to the brim with Mexican beans. There were strings of prayer beads from old Mexico. . . . Mexican turquoise in heavy settings of silver. Silver was then cheaper than tin. Here was to be found exquisite Mexican drawn work and intricate Indian bead work. In deep, old hand-carved frames were pictures, mottoes, wreaths of flowers all cunningly fashioned of human hair, red, black, brown and yellow. There were beaded moccasins and chamois coats, leather trousers, silver trimmed saddles, spurs and knapsacks; great hand-carved chests and cupboards, Indian baskets and jars without number. So many things that were fine and splendid, so many things that were rude and clumsy, the Santa Fé market afforded. Moving among the people were "long lines of burros all but hidden under enormous bundles of faggots. . ., taking good care not to step on [the children]." Carl T. Gilbert, who has "lived here all my life," advocated political action in a letter to the Albuquerque Journal North (February 16, 1990). He deplored Montoya's facilitating more "fast-bum, high-rent, trendy shops targeted to the out-of-towners." One of the very last places a local could go to Downtown for practical needs has been overrun by trinket peddlers. The "old timers" have truly been delegated second-class citizens to the tourists, and condemned to shop in our segregated South Side. About the only thing we have left over the tourists is our ability to vote in city elections. I hope everyone will turn out in March and impress upon our elected officials that Santa Fe's recent over-emphasis on the tourist economy is unhealthy and permanently damaging to our city. Gilbert's pleas were partially heeded. 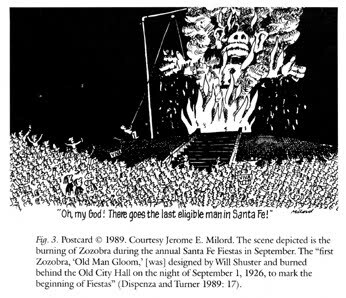 In a May 27, 1990, commentary piece for The Santa Fe New Mexican, "Santa Fe's Blessings Outweigh the Tourism Complaints," newspaper staff member Dan Vukelich reports: "Objections about shameless pandering to tourism played a role in the mayoral race in March when City Councilor Debbie Jaramillo charged that Mayor Sam Pick had sold out this city's residents to hoteliers and resort developers. Jaramillo got about 30 percent of the vote to Pick's 39 percent, but the vote reminded us yet again we're not all of one mind about living in what many Americans describe as the nation's most desirable place." Current letters to the editor are fiffl of terms like "Disneyfication" and "Aspenificiation." The latter term is prompted by reports such as staff member Kelly Richmond's "City Limits: Growing Pains a Sign of the Tunes" in The Santa Fe New Mexican of March 19, 1990. Richmond cites growth questions faced by Taos, Aspen, Irvine, Petaluma, and Boulder. In Aspen, "the median cost of a house has risen to $1 million, prompting city officials to require new business projects to build affordable housing for 60 percent of their employees." As it is, traffic is congested "because the average worker can no longer afford to live in town and must commute" to serve the "upscale tourists and part-time residents" who double the town's population in winter. Santa Fe's most precious commodities are its people and culture-not the value of its real estate nor the tourist dollar. As to the remark attributed to Dickie Montoya that we need more tourist shops because "tourism keeps the local people working," the other side of the coin is that the majority of tourist jobs barely pay minimum wage. Local people do not need more jobs as busboys and waitresses in restaurants serving crab-meat enchiladas and black beans. Nor do they need employment as bellhops and maids in hotels where most Santa Fe residents could not afford to stay. Nor is there a future for our people as salesclerks in trendy boutiques whose only relation to our city are the words "de Santa Fe" after their names. Here, then, are the real Indian maids and the real cow/busboys. Taking the late eighteenth century as a very roughly defined starting point Orientalism can be discussed and analyzed as the corporate institution for dealing with the Orient-dealing with it by making statements about it, authorizing views of it, describing it, by teaching it, settling it, ruling over it: in short, Orientalism as a Western style for dominating, restructuring, and having authority over the Orient. . . . My contention is that without examining Orientalism as a discourse one cannot possibly understand the enormously systematic discipline by which European culture was able to manage�and even produce�the Orient politically, sociologically, militarily, ideologically, scientifically, and imaginatively during the post-Enlightemnent period. It is this sort of "discourse" which led Harriet Monroe to exclaim in Poetry of September 1920: "Why go to Greece or China, 0 ye of little faith? This South-west, which is but one chapter of our rich tradition, is our own authentic wonderland�a treasure-trove of romantic myth-profoundly significant and beautiful, guarded by ancient races practicing their ancient rites, in a region of incredible color and startling natural grandeur" (in Weigle and Fiore 1982: 17). In late twentieth-century America, the Orientalism guiding west-6` em and Southwestern commerce in all senses (of goods and ideas) has to a large extent been supplanted by Southwesternism, a "dis- course" that can be examined in the development of Santa Fe style and other aspects of tourism and Southwest lures. In the 1920s and 1930s Indian Detours capitalized on (for the most part) Anglos' appropriation and mystification (Rodríguez 1989) of native culture. A New Indian Detours might be primarily a Coyote Detours�"coyote" in all its ethnic and postmodem senses. Although blue corn could easily be either the latest yuppie gastro-abomination or a New Age health-food miracle, it is, in fact, an ancient Native American staple and one that distinguishes New Mexican cuisine from its near relatives-Tex-Mex, Cal-Mex, and Mex-Mex food. Corn, whether blue or yellow, forms with chilies and beans the triumverate [sic], some would say trinity, that make up the basis of so-called gastronomy in northern New Mexico. This may sound like poor people's food, and it is. Despite all published reports of celebrities and other rich people moving in droves to Santa Fe, regardless of fancy stores selling big-ticket merchandise, this is not a wealthy state. Nevertheless, the food is as richly satisfying to visitors as soul food can be, and one has only to look at the lines outside The Shed, La Choza, and Rincon de Oso to have the point proved. The Thunderbird-emblazoned Harveycars and drivers would be replaced by lowriders. This would belatedly capitalize on an advertising campaign launched by the Española Valley Chamber of Commerce in the early 1980s. An Anglo male in cowboy hat, three-piece suit, tie, and boots poses with his left hand on the trunk of a 1950s Chevy in an ad on page sixty of New Mexico Magazine, August 1982: "'I've seen the Taj Mahal, a Pacific sunset, and the Northern Lights, but not 'til I visited the Española Valley had I seen a '55 Chevy do a mating dance.'-L.B. (Formerly of New York). Even world travelers haven't seen it all 'till they visit the Española Valley. How about your next vacation? It might open up a whole new world. Write for an information packet." Coyote Detours could thus constellate around Espa∋tlde;ola, helping it to contend with Los Alamos (which in a 1990 brochure advertises itself as "A City Committed to the Future, Rich in the Heritage of the Past" in the "Heart of Northern New Mexico") to become a "satellite" of Santa Fe "per se," in developer Jerry Crassas's terms. The home of the Española joke could then be known as Santa Fe North 2001, and Coyote might thereby enjoy the last laugh on Santa Fe, now home of Roadrunner Tours. B: On the train and lived in Lamy for four years before I knew there was a Santa Fe. C: I have been here all my life and want the rest of you to go back to California, Texas and New York. A. I live in a typically charming Santa Fe-style adobe with no closets. No windows. No hot water. No heat. But lots of vigas and the floor slopes a lot. our lives and won't leave. through on their way to Taos. Page numbers refer to the Signet Classics edition (Twain 1966) of The Innocents Abroad, with an afterword by Leslie A. Fiedler. This text is excerpted from the jacket on the third printing, 1989, of Santa Fe, a photographic essay with photography by Lisl Dennis, text by Landt Dennis, and design by Jerry Herring (Dennis and Dennis 1987). Distributed by Texas Monthly Press, Austin, it cost $35 in March 1990. The Lawrence quotation is from his much-cited essay "New Mexico," first published in Survey Graphic, May 1, 1931 (Sagar 1982: 96). Carl D. Sheppard's study of Isaac Hamilton Rapp (1854-1933), architect of San Diego's New Mexico Building (now the Balboa Park Club) in 1914, Santa Fe's Museum of Fine Arts in 1917, and La Fonda in 1920, emphasizes the importance of achieving statehood on January 6, 1912, and the San Diego Panama-California Exposition of 1915 in the development of Santa Fe style. Sheppard (1988: 75) cites a flyer for the New-Old Santa Fe Style Exhibition (opened November 18, 1912), commissioned by the Chamber of Commerce on August 28, 1912, with a two-fold purpose: "1st. To awaken local interest in the preservation of the Old Santa Fe and the development of the New along the lines most appropriate to this country. 2nd. To advertise the unique and unrivalled possibilities of the city as 'THE TOURIST CENTER OF THE SOUTHWEST.'" Contemporary Santa Fe style has been canonized and popularized in Christine Mather and Sharon Woods (1986). The final paragraph of its front jacket flap copy reads: "Here is not only the romance of Santa Fe, but the irresistable [sic] appeal of its life-style�a casual elegance enlivened by a dynamic, ever-changing mixture of the old and the new, the West and the East, the plain and the sophisticated. In addition to the wide range of design ideas offered by the illustrations is a list of sources directing readers to Santa Fe merchants and services." Santa Fe art colonist Will Shuster, one of Los Cinco Pintores, invented "piñion and juniper incense ... in the lean and hungry homestead days of the 1930s." He began marketing it a decade later, "accompanied by a variety of bumers ... in a package that he designed. The first pueblo bumer was created for Shus by his close friend Maria Martinez." Shuster's "scent of the Southwese, was "piñion and juniper sawdust with a gummy binder and potassium nitrate. In 1956 he sold the formula and the small incense business that he Coperated out of his studio for $1,358. 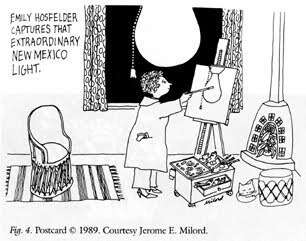 Today it is still marketed as a souvenir of Santa Fe and the package still bears his original artwork" (Dispenza and Turner 1989: 123, 127). The Santa Fe Reporter of January 17-23, 1990, announced: "Crassas, a Greek citizen, also has been convicted of crimes in Greece 48 times, according to Greek law enforcement authorities. And he is listed in federal computers as 'excludable' from the United States, a designation reserved for aliens deemed undesirable and possibly subject to deportation proceedings." Columnist Robert Mayer concluded: "Our local Greek tragedy has run its course. The deal for the Forked Lightning Ranch most certainly is dead; Greer Garson has never been a woman who consorts with gentlemen wanted by the police." 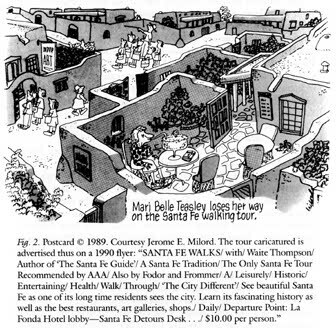 Nevertheless, the Albuquerque Journal North of February 7, 1990, reported that Crassas planned a similar project near Washington, D.C., claiming that, despite losing the Pecos opportunity, "one of our interests is to buy a hotel within Santa Fe proper ... so we dony have to face any laws or envirotunental problems or opinions of the neighborhoods. An existing business might suit us better." 7. I am gratefull to Mary Powell, one of my partners in Ancient City Press, for relating this incident to me during a discussion of the book business in Santa Fe, which she now calls "Hawlin' Dawg Gulch." The color photograph shows six coyotes sitting in front of a white wall hung with eleven snakes. The caption reads: "Carved and painted wooden snakes by Paul Lutonsky and coyotes howling at the moon by Alonzo Jiménez have captured the imaginations of Santa Fe residents and visitors. The snakes dangle over doors and windows, replace a framed picture over the living-room couch, and slither across bancos" (Mather and Woods 1986: 121). Rosalea Murphy (1988: vii-viii) opened the Pink Adobe Restaurant in the summer of 1944, "in the Barrio de Analco, across the street from the San Miguel mission, in Santa Fe ... [which] was a lazy, sleepy town then; we bought wood from old men who wandered the streets, slowly leading their supply-laden burros through town." She started with Creole and Cajun-inspired cookery and developed an eclectic style, "the direct result of a blending of various cuisines on a Santa Fe palette. It is my hope that you will find my recipes unique, just as the city of Santa Fe is unique. Santa Fe is a focal point of racial meetings. And ... it attracts a colony of anthropologists, scientists, artists, writers, and moviemakers far out of proportion to its size ... [who] also contribute through educated tastes and lives of diverse experience an influence in terms of cooking." The card's calligrapher is Dawn Denham of Santa Fe. The text is from Almon Gunnison (1844-1917), Rambles Overland: A Trip Across the Continent (Boston: Universalist Publishing House, 1884). Efforts to stop the eviction were unsuccessful, and on Saturday, May 26, 1990, automobile traffic along Burro Alley was stopped for a festival with "mariachi band, refreshments, mountam man, face painting" from 10 a.m. to 7 p.m. According to the ad in the Santa Fe Reporter of May 23-29, 1990, the stores opening were: Down & Outdoors in Santa Fe: The Quality Down Outlet Store; 31 Burro Alley: Art, Accessories, Furnishings; Pueblo Trading Co.: Jewelry, Pottery, Kachinas; and Jeff Lewis Trade Roots Collection: Fetishes, Rugs, Pillows, Folk Art. 1982 Mythologies (1957). Translated by Annette Lavers. New York: Hill and Wang. 1981 "The Most Interesting 100 Square Miles in American and Its Impact on Santa Fe." La Gaceta: El Corral de Santa Fe Westerners 7(l): 1-19. 1974 History of the Atchison, Topeka and Santa Fe Railway. Lincoln: University of Nebraska Press. 1987 Santa Fe. Houston, Texas: Herring Press. 1989 Will Shuster: A Santa Fe Legend. Santa Fe: Museum of New Mexico Press. 1989 The Written Suburb: An American Site, An Ethnographic Dilemma. Philadelphia: University of Pennsylvania Press. 1968 Mark Twain Abroad: The Cruise of the "Quaker City." Chicago: University of Chicago Press. 1980 Mary Colter: Builder Upon the Red Earth. Flagastaff, Arizona: Northland Press. 1954 Commerce of the Prairies. Edited by Max L. Moorhead. Norman: University of Oklahoma Press. 1971 Times and Places (1970). New York: Pinnacle Books. 1983 The Selling of Canada: The CPR and the Beginnings of Canadian Tourism. Banff, Canada: Altitude Publishing, Ltd.
1969 "Meals by Fred Harvey. A Phenomenon of the American West. Fort Worth: Texas Christian University Press. 1979 Kiva, Cross, and Crown: The Pecos Indians and New Mexico, 1540-1840. Washington, D.C.: National Park Service, U.S. Department of the Interior. 1967 Structural Anthropology (1958, 1963). Translated by Claire Jacobson and Brooke Grundfest Schoepf. Garden City, New York: Anchor Books. 1982 "Couriers, Dudes, and Touring Cars: The Legend of Indian Detours." New Mexico Magazine 60(6): 39-41, 44, 46, 48- 49. 1987 Trails Begin Where Rails End: Early-day Motoring Adventures in the West and Southwest. Glendale, California: Trans-Anglo Books. 1945 Santa Fe: The Railroad That Built an Empire. New York: Random House. 1986 Santa Fe Style. New York: Rizzoli International Publications. 1989 Coyote Cafe: Foods from the Great Southwest, Recipes from Coyote Cafe, Santa Fe, New Mexico. Berkeley, California: Ten Speed Press. 1988 The Pink Adobe Cookbook.NewYork: Dell Publishing. 1988 "The Southwest Is an Idea." Southwest Profile, July, 43-44. 1989 The Harvey Girls: Women Who Opened the West. New York: Paragon House. 1989 "Art, Tourism, and Race Relations in Taos: Toward a Sociology of the Art Colony." Journal of Anthropological Research 45:77-99. 1981 Land of Enchantment: Memoirs of Marian Russell Along the Santa Fe Trail (1954). As dictated to Mrs. Hal Russell and edited by Garnet M. Brayer. Albuquerque: University of New Mexico Press. 1982 D. H. Lawrence and New Mexico. Salt Lake City, Utah: Gibbs M. Smith, Inc.
1978 Orientalism. New York: Random House. 1988 Creator of the Santa Fe Style: Isaac Hamilton Rapp, Architect. Albuquerque: University of New Mexico Press with the Historical Society of New Mexico. 1986 Following the Santa Fe Trail: A guide for Modern Travelers. Santa Fe: Ancient City Press. 1989 "Adventure in the Fashion System." Western Humanities Review 43:5-26. 1978 The Southwestern Indian Detours: The Story of the Fred Harvey/ Santa Fe Railway Experiment in 'Detourism'. Phoenix, Arizona: Hunter Publishing. 1985 "The Grand Tour: A Key Phase in the History of Tourism." Annals of Tourism Research 12:297-333. 1966 The Innocents Abroad or The New Pilgrims Progress (1869).New York: New American Library. 1972 "California and the Search for the Ideal. "Annals of the Association of American Geographers 62(2):185-210. 1988 The Lore of New Mexico. Albuquerque: University of New Mexico Press. 1989 "Gourmet Holidays: Santa Fe:" Gourmet: The Magazine of Good Living 49(12):86-92, 210, 212, 214, 216, 218, 220, 222,224,226,228,230,232. 1986 The Spirit of Santa Fe. Albuquerque: Published by Zimet at Starline Press.